The mobile technology company Appcelerator has been around since 2006, and chances are that if you know about it, you mostly think of it as the company behind Titanium, its open-source mobile development environment. In the enterprise world, however, the company has also made a name for itself with its Appcelerator Platform, which is meant to help large companies build apps and mobilize their data. Today, the company is launching a major update of this platform that gives enterprises more flexibility in how they build their apps and how they get their data into them. The days when big companies had 100 percent control over their stack are long over, in large part because of the rise of mobile devices and cloud computing. The company says that today’s update will help companies prepare better for this “post-web reality,” as Appcelerator calls it. As part of this, Appcelerator is making a major shift in how it is making its platform’s capabilities available to developers. Previously, the only way to use the company’s backend services and analytics was by writing a Titanium app. Now, however, the company has released a native SDK for iOS and Android that allows developers to integrate these tools, whether or not the app was built on its platform. As Appcelerator founder and CEO Jeff Haynie tells me, some of his customers use up to 200 different line of business apps in their companies. “Not all of them are using our tools, but now they can use our single dashboard to manage them,” he told me. “We want to give customers choice.” This doesn’t mean the company is not focusing on Titanium anymore, though. Appcelerator is still heavily investing in Titanium, Haynie noted. The other major feature in today’s release is the launch of Appcelerator’s API Builder, which makes it easier for companies to take data from their legacy databases and make it accessible for their own mobile apps or maybe even outside consumption. “We found that we made it easy and fast to build mobile apps,” Haynie said. “But a lot of the time, developers are waiting to figure out how to get data from their systems into their mobile apps. With API Builder, we are trying to get this data mobile.” The company offers a number of connectors for most of the popular database systems, as well as Salesforce and other platforms. 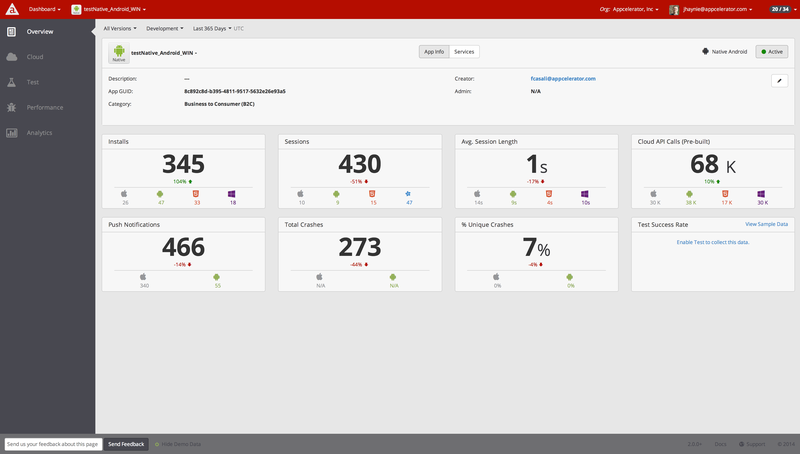 Other new features in today’s update include an improved analytics service that now makes it easier to create custom views and funnels, as well as the ability to use the Appcelerator Platform in a private cloud for organizations that need to comply with regulatory requirements that prevent them from using off-premise hosting.